Actress Sunshine Dizon posted a cryptic post on her official instagram account after her husband, Timothy Tan released a statement about their annulment. She didn’t directly mentioned a name but many believed that it’s for her husband. She posted a quote with a caption that she will not give him an annulment and she will not forgive what her husband did. She also warned Timothy and the alleged mistress to see them on court. 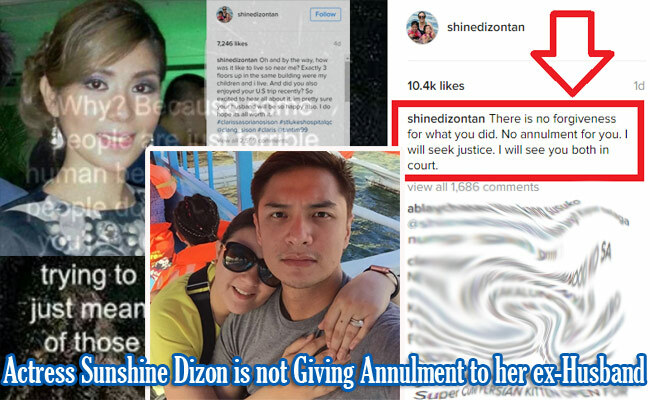 The estranged husband of Sunshine Dizon broke his silence about reports that he and his wife had marital problems. He confirmed the news last June 20 by giving a statement to various entertainment websites. Timothy and Sunshine has been married since 2010 and there were news that they tried their best to save their marriage. Unfortunately, Timothy revealed that their 6 year marriage is now over. He also added that their marriage experienced many challenges early this year and they tried their best to solve their issues but they decided that it’s better for them to have an annulment. Timothy then insists that he will continue his obligations for his 2 kids. He also apologized to the people and families involved regarding their separation and ask some privacy to the public. There is no forgiveness for what you did. No annulment for you. I will seek justice. I will see you both in court. The 32 year old actress shocked everyone last June 17 when Sunshine posted a letter on her instagram account that was allegedly written by her husband’s mistress that she named Clarissa Sison who works at St. Lukes Medical Center. She also tagged Timothy and Clarissa’s instagram accounts at the end of her caption. On her next post, Sunshine posted a photo of Clarissa with a caption on how it is to live 3 floors way from them at the same building. She also revealed the US trip of Clarissa and her husband that was unknown from Clarissa’s own husband. The next day, she posted meaningful quotes towards Timothy then posted a photo of her 2 kids whom she called her strength on this difficult time. Meanwhile, Clarissa asked the public to stop bashing her and asked them to stop believing what you see on the internet. At the end of her post, she insists that she did not do anything wrong.